A 2x longshank hook, ideal for both nymphs and dryflies and suits tying patterns from hares ear nymphs and damsels to dry daddies and mayflies. 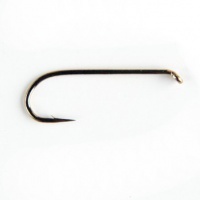 The Fulling Mill Nymph/Streamer Hook is a 2x longshank hook, ideal for tying anything that requires that little bit of extra space. This hook is ideal for both nymph imitations and dryflies and suits tying patterns from hares ear nymphs and damsels to dry daddies and mayflies. Round bend, forged, down eye, 2x long, bronzed. 2x Fine Micro-barb Long taper point. Standard of dry fly fishing offering fine but strong hooks to tie terrestrials like CDC ants, BWO and dry muddlers.